Developers, users, and Microsoft, perhaps most of all, are eagerly awaiting the Oct. 26 release of the Windows 8 operating system, what could be the biggest thing for Washington-based company since Windows 95. However, what we see that Friday might not be a fully baked version, at least according to Intel's CEO. Speaking before employees in Taipei Tuesday, Otellini reportedly said the OS is launching before it's ready, with improvements still needed. According to Otellini, Microsoft is anxious to get its operating system out in the world, especially as other companies' devices, like the Lenovo ThinkPad Tablet 2 - as well as Microsoft's own Surface tablet - need it in order to function. 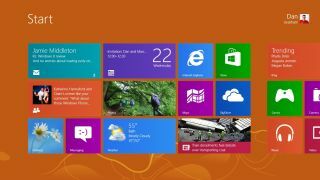 Although the Windows 8 OS won't be quite ready by Halloween, Otellini reportedly told the gathered group that Microsoft's strategy revolves around getting the system into computers and tablets before the holidays. It's actually the right move, Otellini said, allowing Microsoft to grab some market share and release improvements after the fact. Intel is Microsoft's closest partner, according to Bloomberg. However, critics like Michael Cherry of Directions on Microsoft - a business that provides independent analysis of Microsoft technology, licensing, and strategy - have expressed concerns about an incomplete OS. Cherry reportedly said that although the system is fundamentally sound, it lacks "robust applications" that prevent PC makers from fixing problems in "drivers," or the devices that connect hardware to software, such as printers. Another critic wrote a research note on Sept. 13 addressing similar disquiet. "We are concerned at the level of bugs and fine tuning that appears necessary to get the beta systems we demoed ready for prime time," Alex Gauna, an analyst with JMP Securities, wrote in response to versions of Window 8 shown at a recent Intel developers' forum. Although, by all appearances, Microsoft is confident in moving forward with its scheduled release, history has shown that launching an unfinished OS can backfire, as was the case with Vista in 2007. That company launched a late version of Windows that flopped as it initially didn't work with many applications and drivers. Meanwhile, a Microsoft spokesman told Bloomberg that, thanks to more than 16 million active preview participants, Windows 8 has undergone rigorous testing and review and is "[the most] ready operating system in Microsoft's history." With a host of devices set to launch along with the OS, no matter what state of readiness it finds itself in, Microsoft stands to at least cash in on the excitement of an operating system that isn't iOS or Android hitting the market. TechRadar has reached out to Microsoft for further comment and will update this story if and when we receive information from the company.